The Special Operations Forces of Russia, or SOF (Russian: Силы специальных операций; ССО, tr. 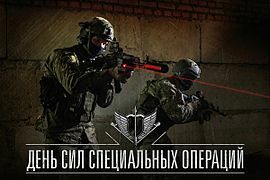 Sily spetsial’nykh operatsii; SSO) are strategic-level special forces under the Special Operations Forces Command (Russian: командование сил специальных операций; KCCO, tr. Komandovanie sil spetsial’nalnykh operatsii; KSSO, or KSO) of the General Staff of the Armed Forces of the Russian Federation. 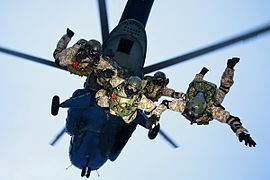 The first units of what would become the Special Operations Forces were formed in 2009 as part of the continuing 2008 Russian military reform. The Special Operations Forces Command was set up in 2012 and announced in March 2013 by the Chief of the General Staff Valery Gerasimov. 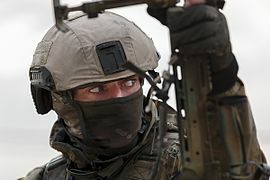 According to Gerasimov, the SOF was designed as a strategic-level asset, whose primary missions would be foreign interventions, including sabotage and anti-terrorism operations. 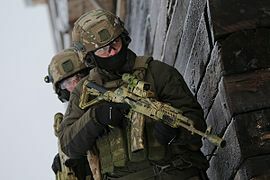 SOF do not belong to any branch of the Russian armed forces and are distinct from the Special Forces of the Main Directorate of the General Staff of the Russian Armed Forces that until 2010 were under the Main Intelligence Directorate (GRU) and whose subsequent subordination appears to be unclear. Russia′s SOF are manned exclusively by professional personnel hired on contract, in commissioned officer positions. In February 2015, President of Russia Vladimir Putin decreed that 27 February be the Day of the SOF to mark, according to Russia′s official news media (albeit not acknowledged formally), the establishment of Russian control over the building of the Supreme Council of the Autonomous Republic of Crimea in Simferopol, Ukraine, in February 2014. 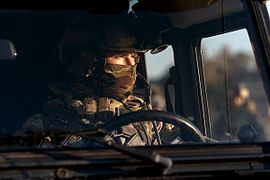 The Forces are a highly mobile, well-trained and equipped, constant combat readiness special operations force of the Russian Ministry of Defense, designed to perform specific tasks in order to protect the interests of Russian Federation (with application of military force, by necessity), both within the country and abroad, in peacetime and in wartime. 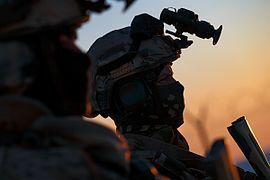 The Russian Ministry of Defense defines the term "special operation" as "methods and ways of fighting not characteristic of conventional forces: reconnaissance and sabotage, subversion and sedition, counter-terrorism, counter-sabotage, counterintelligence, guerrilla, counter-guerrilla and other activities". In 2009, as a part of the comprehensive reform of the Russian Federation's Armed Forces, Special Operations Directorate, subordinate directly to the Chief of the General Staff, was created on the basis of the military unit Senezh in the Moscow region. The unit saw extensive action in the Caucasus region and earned the nickname “podsolnukhi” (sunflowers), a nickname given to the soldiers assigned to the unit while serving in Chechnya. It was reported that Colonel Oleg Martianov, who later became a member of the board of the Military-Industrial Commission, was one of the founders and first commander of the SOF in 2009−2013. In 2012, the Special Operations Directorate was reorganized as Special Operations Command, which was followed by plans to upscale the Forces manpower up to 9 special purpose brigades. 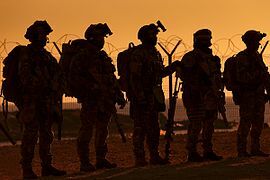 On 6 March 2013 the Chief of General Staff of the Russian Armed Forces Valery Gerasimov announced the beginning of the Special Operations Forces creation. While speaking to foreign military attaches in Moscow, he said: "After reviewing the practice of the formation, training and the use of special operations forces in the leading countries of the world, Russia's Defense Ministry has also begun to create them... A corresponding command was created, which is engaged in planning work and implements plan of training of the Armed Forces... A set of documents has already been elaborated to determine the direction of development, methods of training and application of these forces". In March 2013, according to Russian media reports, creation of the Special Operations Center of the Ministry of Defense of Russia for around 500 professional soldiers began in the suburban village of Kubinka-2. Formation of the Center was scheduled to be completed by the end of 2013. The center was directly subordinated to the Special Operations Forces Command of the Russian Ministry of Defense. 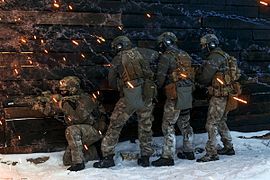 At the end of April 2013, units of Special Operations Forces conducted a special tactics exercise at Elbrus mountains at the height of 4,5 kilometers. The exercise was dedicated to practice transportation of one of the SSO units by military transport aviation and army aviation, as well as air insertion of personnel and cargo into target area. 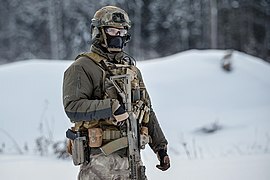 In May 2013, the General Staff said that SOF would be tasked with security of the Winter Olympic Games in Sochi and that SOF now comprised air and naval components. In 2014, unidentified men with military weapons began blockading Ukrainian bases in Crimea, and on February 27, around 50 men seized the Crimean parliament building. 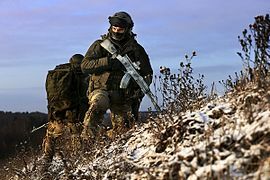 While claiming to be a local militia, this well-armed and highly professional unit turned out to be the first deployment of Russia′s special operators. According to Russian media reports, the commander of SOF then was Alexey Dyumin, who personally conducted operations in Crimea. 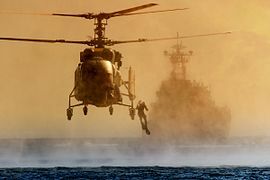 Special Operations Forces of Russia have been involved in Syria, primarily conducting target acquisition for Russian Air Force combat planes as well as for other purposes, such as the training of Syrian government troops, elimination of fighters and destroying critical enemy objects. During the battle of Palmyra in March 2016, Special Operations Forces senior lieutenant Alexander Prokhorenko was killed. SOF have been tasked in recovering the flight recorder of Russia’s downed Su-24M back in November 2015, and reconnoitering targets for cruise missile strikes, disruption behind enemy lines through ambushes, high value targeted assassinations and retaliation strikes against select groups of fighters. The SSO also played a crucial role in the battle for Palmyra in Spring, 2016 and provided support in the Syrian push for Aleppo in the same year. While official numbers are classified, between Senezh and Kubinka there are between 2,000 and 2,500 total personnel. Aditionally, the Command also has supporting elements, that provide Combat Support and Combat Service Support functions. Furthermore the Command has a dedicated special aviation brigade that directly controls combat aviation assets at Torzhok, and a squadron of Ilyushin Il-76 transport aircraft at the Migalovo airfield near Tver. 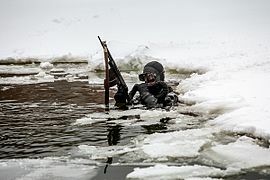 The training of the officer recruit special operators is carried out in the Ryazan Higher Airborne Command School – RVVDKU (department of special and military intelligence and the department of the use of special forces) and the Novosibirsk Higher Military Command School – NVVKU (department of special intelligence and the chair of the special reconnaissance and airborne training). 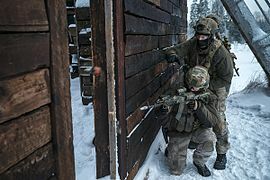 At Senezh, potential operators learn skydiving, mountaineering, swimming and scuba diving, and storming buildings and homes, while Kubinka-2 focuses on marritime operations and recon and controlls several naval special operations detachments. There is also a cold weather/mountaineering training centre at Mount Elbrus named “Terskol,” in Kabardino-Balkaria. Additionally, depending on the individual tasks the soldiers are being prepared for, the training is more in-depth. Wikimedia Commons has media related to Special Operations Forces of Russia. ^ Sputnik. "Russian Aviation, Special Forces Play Key Role in Crushing Daesh Near Palmyra". sputniknews.com. Archived from the original on 2017-10-11. Retrieved 11 October 2017. ^ "Силы специальных операций (ССО)". Ministry of Defense of Russia (in Russian). Archived from the original on 2017-09-06. Retrieved 22 September 2017. ^ a b c Marsh, Dr. Christopher (2017). Developments in Russian Special Operations - Russia's Spetsnaz, SOF and Special Operations Forces Command (PDF). CANSOFCOM Education & Research Centre Monograph Series. Ottawa, Ontario: Canadian Special Operations Forces Command. ISBN 9780660073538. Archived (PDF) from the original on 2017-10-19. Retrieved 22 September 2017. ^ a b c «Наиболее сложная и опасная работа»: как Россия использует Силы специальных операций Archived 2018-08-28 at the Wayback Machine RT, 27 February 2018. ^ a b c d e День сил специальных операций в России Archived 2018-08-28 at the Wayback Machine RIA Novosti, 27 February 2018. ^ a b Россия решила создать силы специальных операций Archived 2018-06-27 at the Wayback Machine RIA Novosti, 6 March 2013. ^ Mark Galeotti. The rising influence of Russian special forces Archived 2018-08-27 at the Wayback Machine Jane's Intelligence Review, 2014. ^ В Вооруженных силах РФ созданы силы специальных операций Archived 2018-08-28 at the Wayback Machine RIA Novosti, 23 March 2013. ^ John Pike. "Spetsnaz Order of Battle". Archived from the original on 2015-09-10. Retrieved 31 July 2015. ^ Вежливые люди получили свой День Archived 2018-06-12 at the Wayback Machine Rossiyskaya Gazeta, 27 February 2017. ^ "Эксклюзивные кадры действий Сил специальных операций МО РФ в Сирии". Archived from the original on 2017-03-03. Retrieved 2017-03-03. ^ Появилось видео работы бойцов Сил спецопераций ВС РФ в Сирии Archived 2018-08-28 at the Wayback Machine TASS, 2 March 2017. ^ Sputnik. "Russian Engineers Develop Next Generation Multipurpose Body Armor". sputniknews.com. Archived from the original on 2017-10-11. Retrieved 11 October 2017. ^ Эксперт рассказал, каким будет бронежилет спецназовца будущего Archived 2018-08-27 at the Wayback Machine RIA Novosti, 27 February 2017. ^ Начальник Генштаба ВС РФ Валерий Герасимов: Россия создает силы специальных операций Archived 2018-08-28 at the Wayback Machine tvzvazda.ru, 6 March 2013. ^ "День Сил специальных операций. Досье". TASS. 27 February 2015. Archived from the original on 2017-03-19. Retrieved 2017-03-04. ^ «Вежливые люди» отмечают годовщину Archived 2018-08-27 at the Wayback Machine gazeta.ru, 27 February 2017. ^ Cозданные в РФ силы спецопераций займутся обеспечением безопасности ОИ Archived 2018-08-28 at the Wayback Machine RIA Novosti, 18 May 2013. ^ Interest, The National. "Get Ready, America: Russia Has Its Own Deadly 'Delta Force'". Archived from the original on 2017-04-13. Retrieved 12 April 2017. ^ Post, Washington. "New battlefield video shows how Russia's elite KSO military unit is fighting in Syria". Archived from the original on 2017-05-06. Retrieved 8 April 2017. ^ Galeotti, Mark (2015). Spetsnaz: Russia's Special Forces (Elite ed.). Oxford, UK: Osprey Publishing. p. 50. ISBN 978-1-4728-0722-9. Archived from the original on 2017-04-09. Retrieved 11 April 2017. ^ Front, South (2017). "Russian Special Operations Forces". Archived from the original on 2017-04-12. Retrieved 11 April 2017. ^ "«Ъ»: новый глава Тульской области руководил эвакуацией Януковича с Украины". Archived from the original on 2018-06-12. Retrieved 2018-08-27. ^ Вот Тула прилетела: Алексей Дюмин сменил Владимира Груздева на посту губернатора Archived 2018-08-28 at the Wayback Machine Kommersant, 3 February 2016. 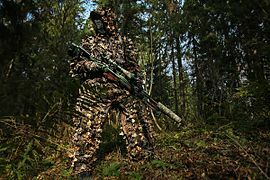 ^ "UK Mirror: Russian Spetsnaz Special Forces Sent In to Protect Assad". Newsmax. Archived from the original on 2016-03-04. Retrieved 2016-03-25. ^ "Press review: Sochi forum ends recession and GLONASS plays key role in Syria". Archived from the original on 2017-10-11. Retrieved 11 October 2017. ^ Sputnik. "Russian Aerospace Forces Have Eliminated Over 3,000 Militants in Syria in 2017". sputniknews.com. Archived from the original on 2017-10-11. Retrieved 11 October 2017. ^ "Russian military says special forces officer killed near Palmyra". Reuters. 24 March 2016. Archived from the original on 2018-07-11. Retrieved 2018-08-27. ^ День Сил специальных операций РФ. Досье Archived 2018-08-28 at the Wayback Machine TASS, 26 February 2018. ^ Телеканал ЗВЕЗДА (1 March 2017). "Бойцы Сил специальных операций действуют в Сирии: эксклюзивные кадры". Archived from the original on 2017-04-05. Retrieved 11 October 2017 – via YouTube.